The comments on my post from yesterday prompted me to think about the changing direction in Australian politics. What the parties are doing reflects where the people are. Here is my, admittedly subjective, attempt to map the dynamics. The informals are really the Latham informals. The Coalition actually moved north west during Turnbull and now has realigned with the movement Labor is taking. What this shows is that there is a ‘north’ gap emerging in Australian politics and to some extent an ‘eastern’ gap too although I would gather that the Greens ascendancy is occurring precisely because they are moving ‘east’. Anyhow I am not wedded to any of this, but I think this is the useful exercise to make sense of all of this stuff and perhaps for people to start thinking about what new parties we might need in the mainstream. I disagree with the position of the informals. Surely if the big parties are moving in their direction the informal vote would DECREASE? Personally, I voted informally precisely because the majors are moving in the absolute wrong direction in the above diagram. Maybe I’m the exception, but the people I know who voted informally did so for similar reasons. I want a socially progressive, free(ish) market party. 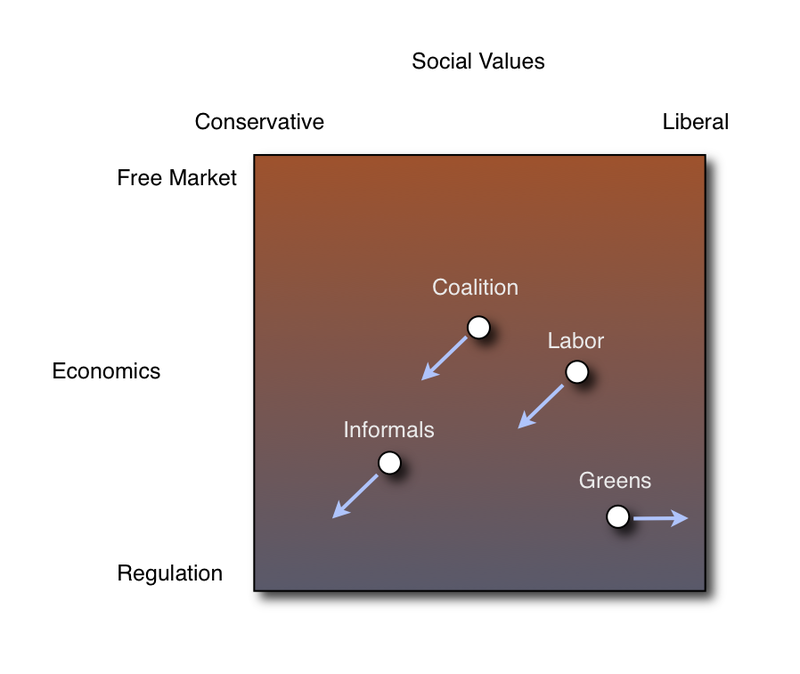 Are the Greens really moving on the political plane? I roughly agree with John on the informals, but I would say that it’s more because the major party arrows should be pointed at each other, with informals existing in some kind of arc surrounding them (on the opposite side to where the Greens are). It’s very hard to build a new party in Australia. If they start getting votes the incumbents tend to co-opt their key policies and make them redundant. The Coalition did it with One Nation, and Labor would do it to the Greens if they got an ETS through. Actually I think that sort of analysis is part of Labor’s problem. It sees trends in one particular world view, being a world view that betrays certain biases. A more relevant set of criteria would reflect the growing sophistication of the electorate. It would show that voters recognise and reject blatant attempts to manipulate them. That’s the basis of the frequent complaints that Labor lacks core values, and the high informal vote. The new criteria would also reflect voters’ perception of how reliable the party would be in governing. Most voters just want to get on with their lives, confident that the country is being managed properly. On those criteria, with Perceived Reliability up the Y-axis, and Frankness along the X-axis, Labor has travelled south west while the Coalition has travelled north east. I happened to be thinking something similar yesterday, but thought it would be likelier that one of the existing parties would split apart than to have an entirely new party form. If ALP form govt we get no NBN, no CPRS, no RSPT eg free market direction on the economics dimension due to lack of majority, if Coalition form govt there is the same outcome by policy. The electorate seems to be indifferent on the social values dimension. This exacltly balances the data moments you created in the matrix.